Audeom 5W B-22 White LED Bulbs (Pack of 20) is a premium quality LED Bulbs from Audeom. Moglix is a well-known ecommerce platform for qualitative range of LED Bulbs. 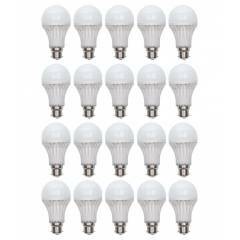 All Audeom 5W B-22 White LED Bulbs (Pack of 20) are manufactured by using quality assured material and advanced techniques, which make them up to the standard in this highly challenging field. The materials utilized to manufacture Audeom 5W B-22 White LED Bulbs (Pack of 20), are sourced from the most reliable and official LED Bulbs vendors, chosen after performing detailed market surveys. Thus, Audeom products are widely acknowledged in the market for their high quality. We are dedicatedly involved in providing an excellent quality array of Audeom LED Bulbs. Audeom is good White LED Bulbs, very efficient, relibale and durable product at very less price. it is Perfect product for Home Décor. Fabulous services! Shipping services was lightening fast, delivery was tracking and the product was exact as displayed in website. Thumbs up to the team! I Bought this product form Moglix online store.True white colour and the right light is more energy efficient and provides energy savings thus reducing your monthly electricity bills.you can also save up to 90 percent of energy in comparison to a conventional bulb.